This is the third article in a five-part series entitled Building Hamilton's Protected Cycling Network. Today's article is Part 3: Building the network: James Street GO Station. Construction of this GO Station is nearing completion. It is a key piece of the provincial government plans to deliver improved GO train service to Hamilton. This new GO station will be a key gateway and entrance to Hamilton for people arriving by train. The new GO station was designed for its main entrance and cycling infrastructure at James Street North. That is where the bike parking and Hamilton Bike Share hub station are going to be put by Metrolinx and the provincial government. However, City of Hamilton staff are planning no actual infrastructure on James Street to get people from the GO station to the Cannon Street protected bike lanes ... or anywhere else. Bay Street is in the Cycling Master Plan for bike lanes, but those are not going to the GO Station until Bay Street is resurfaced, which will be well after the station opens. Currently, City staff are suggesting that people use MacNab Street to get to the GO Station when it opens. There is no cycling infrastructure there, but at least it is a quieter street. The problem is that the GO Station is being built for people to arrive by bicycle at the James Street main entrance. That is where the bicycle parking, SoBi station, ticket office, washrooms and so on are going to be. If the City of Hamilton is providing no access or cycling infrastructure on James Street, this will frustrate the plans of the provincial government for cycling access to the GO station. What is needed is a short stretch of protected bike lane on James Street from Cannon to the GO Station. But there are no plans for that to happen. The whole point of the protected bike lanes on Cannon Street was that they were to be the start of a network of protected bike lanes helping people to get from A to B.
I'm not sure about this. Perhaps those behind the Yes We Cannon campaign had hoped it would become the start of a network, but unless someone at city hall has drawn up a grand plan with a full network of protected bike lanes without anybody hearing about it, I don't think there is any plan at city hall. Hence the need for groups like Yes We Cannon. We may need similar citizen engagement campaigns for every single bike lane we want to see built. Precisely. The city’s Cycling Master Plan does not even have a transportation mode share target for cycling. Just for walking and cycling together. And need same for LRT, apparently. anything not involving acres of box store parking and multi-lane roads that run mostly empty all day aren't being planned for at city hall. We need to convince staff and council that transit, walking and biking are really just more highways. They'll whip up a dynamite plan in a jiffy. This is a no-brainer. Hopefully prov will save city from itself and just impose something to make at least this protected bike lane happen. No wonder nobody wants to live there and the city is decaying. yup, it's common world-wide. Another new one just built in Toronto this week. But we can't do this in Hamilton because we have to encourage cars to speed recklessly through family neighbourhoods when drivers want a change of scenery from speeding recklessly on all the mega-wide, overbuilt main streets. You could do whole article on wasted hatched-off space right where a bike-lane or two-way conversion needs to be. Want to keep traveling any direction but North at the end of York Boulevard's westbound bike-lane? Again, contra-flow lanes are hard, but just hatching off space is easy. See also Caroline (no picture) - blocking off a lane into a dead-end was easier than continuing the 2-way conversion all the way to York, or providing any kind of cycling infrastructure. Obviously the reason Caroline wasn't converted to 2-way all the way up to York was because of the hair-pin turn at York, but thanks to York's bike-lanes that's no longer a hair-pin right turn - you now turn into the 2nd lane instead of the 1st. Therefore, Caroline could be 2-way right to York. It would require nothing but signs and paint - not even a changed traffic light. And that's all just my own personal commute! There I'm sure other areas of the city could list just as many absurdities. And there was no money budgeted for that, even though it's included in the Transportation Master Plan. 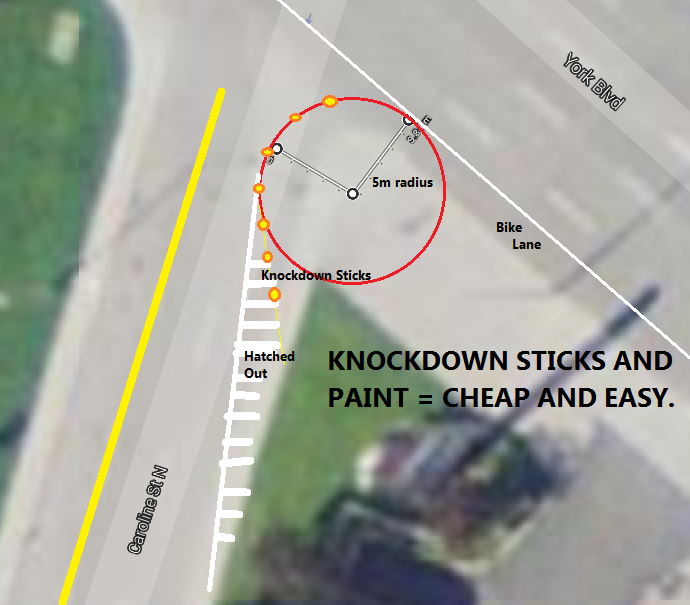 That's ludicrous - you wouldn't even need concrete, you could guide drivers around the turn by closing a lane and using some knockdown sticks, which as you've mentioned before are practically free. It's got 3 lanes so it would work as 1 in and 1 out after the knockdown sticks take the 3rd for curving. Or, if that's too much change for the city to handle, then make it full two-way to Market, one way with contraflow bike lane to York. That fixes the hole in the cycling network with no angst about turning radii and sightlines. The number of motorists who would want to use Caroline to reach York must be practically nil. Oops, I meant Napier, not Market. A little off topic, but speaking of the new James North station, has a tentative train schedule been released or proposed for that yet? Haven't been able to find much info on it and it''s due to open in a couple months. A recent Spectator article indicates that we'll be getting just 4 trains a day until 2025. So we're looking at two more trains in the morning and two in the evening. Well, it could be more, but I'll take what I can get. Thanks.